As usual Jason leans to squirrelling away his glass and hiding it in storage boxes.. This particular vase is actually quiet new, it was recently made in about July or August 2016. We have gone ahead and added it to Jason’s Etsy shop because it just is too stunning to wait for it’s forever home at the glassblowing studio any longer. The vase is very thick and quite heavy but doesn’t lose it’s elegance at all. You know how sometimes thick glass isn’t very elegant? Well this vase is stunning and exquisite! What an incredible statement piece it will be in somebody’s home who also loves this rich lucious colour! If you are getting the feeling that I am reluctant to part with this beauty then you would have guessed right! But we often move house and until we one day own our very own beautiful little villa we shouldn’t hold on to objects of desire that should really be enjoyed in the present moment. Let’s not delay! May you feel inspired to acquire this treasure. Jason accepted employment in a key position with a successful West Coast glassmaking company and got really busy working a few regular shifts each week for them. 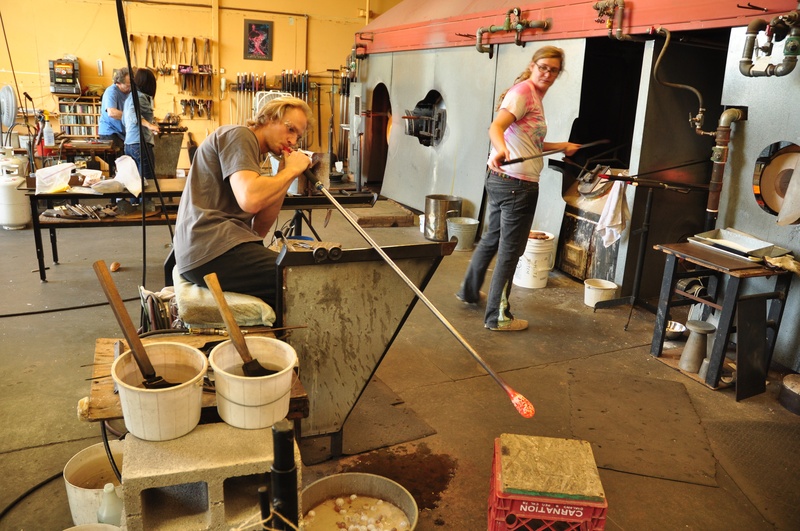 Additionally there were so many glassblowing classes to teach and students to manage that somehow we fell off the wagon keeping you up to date with it all. 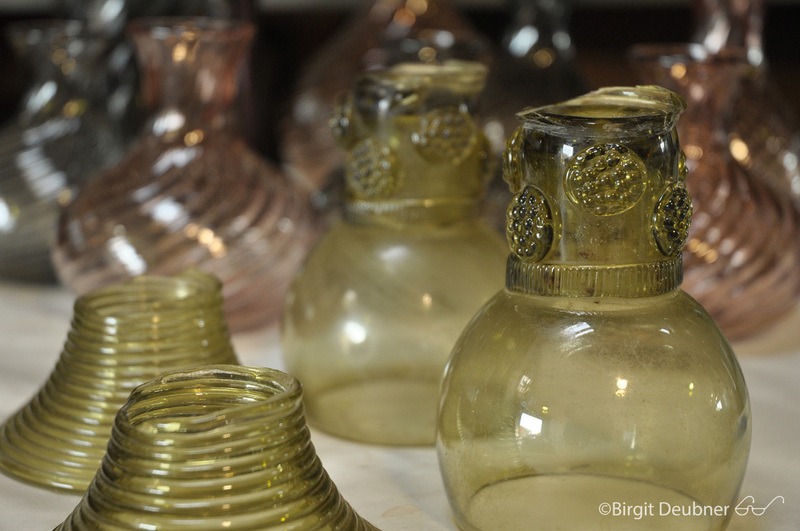 Birgit (who takes the photos and does a lot of the posting, but not all) hasn’t been able to spend time at the glassblowing studio to capture all the glassmaking sessions with Jason’s students, which is why there is so little to share at the moment. What we do have are some amazing feedbacks from students of the past 3 months. Incredibly positive and very happy customers! Did this wet your appetite, too? You can book classes STRAIGHT through Jason for a lower cost than using our booking agent. Or if you don’t know Jason go ahead and DO use our booking agent (that link above the feedback will take you there). For all other’s: click on the ‘HOME’ button and you will see options: shop (pay Jason directly) or take classes: pay the booking agent who takes a total of 20% of the price you pay in fees.. 5% fees you pay and 15% we pay. Gig economy… Always go straight to the artist when you feel confident to do so! … this is where if you were new to glassmaking you would learn about the fact that once in a while each ceramic melting pot, sitting inside the furnace, will develop a crack, due to erosion and unforeseeable factors.. Once the crack deepens it either causes molten glass to leak or an effect takes place that is best described as ‘cords’ developing in the glass, which float on top of the molten glass and can appear in the blown glass pieces as raised cord like areas.. This is rendering the molten glass a lower quality and hence creating an unworkable situation. 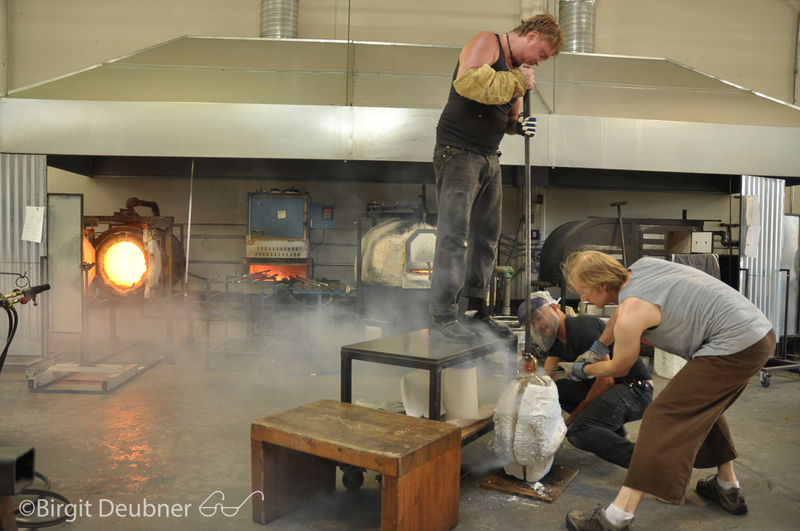 This is when it is time to face the challenge and begin a 10 day process of cooling the furnace and molten glass slowly (several days), changing the ceramic crucible (ceramic pot that holds the molten glass) and bringing the furnace and a new batch of glass back up to temperature. The entire process takes somewhere around 10 days. Of course this can throw a real spanner in the works when multiple glassmakers all booked time to create glassworks, when students lined the doors to take classes… We got lucky and Jason is able to continue teaching his glassblowing classes at Glass Hand Studio, a Glass studio on the lovely island (which originally was a peninsula) Alameda, just down the road from Oakland. Jason had met the owner Prax recently at a Jeff Mack, goblet making workshop that Jason assisted at. We are really happy that Prax can host Jason’s classes! Sometimes walking around the glass studio we see some surprises, here is some antique czech glass stemware belonging to Alex Abajian. The coils that you see the foot being made with: these demonstrate one of the oldest glassmaking process that were used before glass was even blown; whereby molten glass was wound around a clay core to create vessels.. In the foreground: Antique czech glass seen at Alex Abajian’s glass studio in Oakland. This process was followed by the advancements brought by mould making and casting glass and only in 50 BC did blown glass enter the scene. 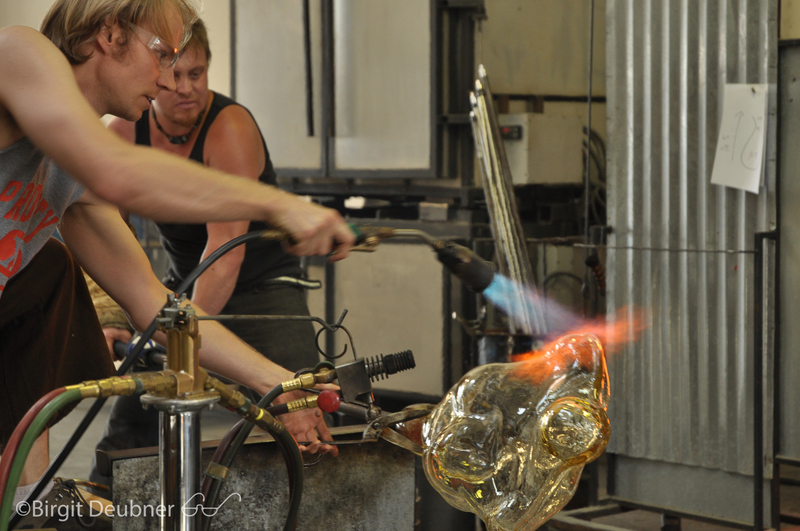 This was one of the most exciting projects that I have been able to witness at the Glass Studio so far. The teamwork among these glassmakers is really great, there is a huge amount of competency coupled with fantastic working atmosphere. The day is spent working incredibly hard with serious concentration and yet there is always a surprise moment when Alex’s intelligent sense of humour gives occasion for laughter and short refreshing relief. 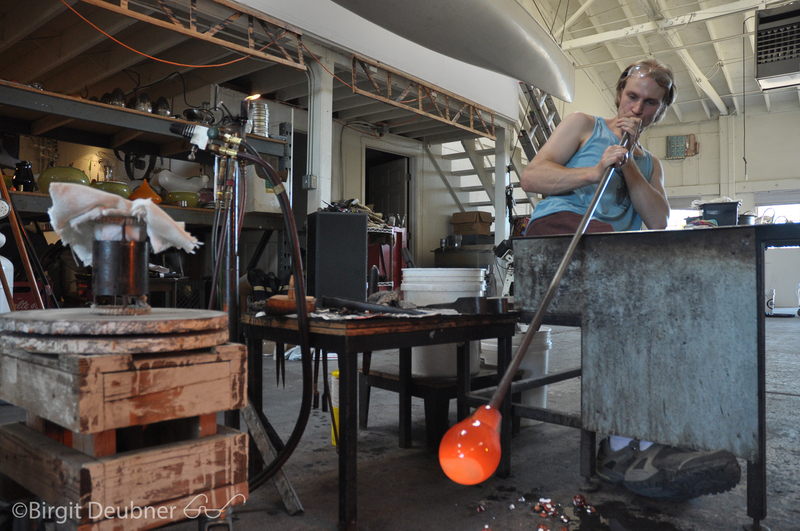 I have rarely seen people work so incredibly well together as here at Glow Glass Studio in Oakland. Witnessing this process and the attitudes the makers and artists here have with each other has done a lot for my appreciation of the craft and technical skills-manship but also is taking dusting influence over both Jason and my (Birgit’s) future choices of places to live and creative paths to pursue. Having this opportunity to be here is incredible. Seeing all this hard work affects hugely how I, as an artist and glass-layperson, am able to appreciate this material and the possible forms of expression. Coming from a conceptual arts background it is refreshing to be surrounded by the down to earth labour these creatives are bringing to the table each day. 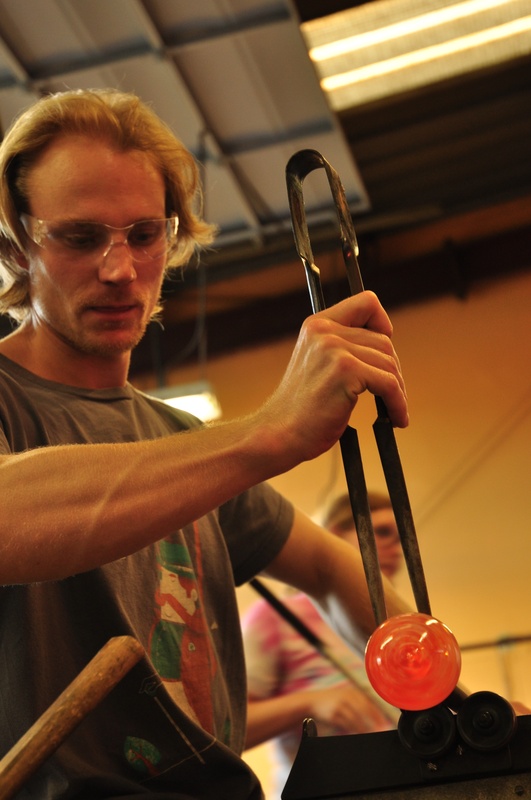 After witnessing just how much dedication and years of skill are required to excel in this field, seeing the amount of dedication as well as equipment required to build a smooth running glassblowing workshop changed my perception a lot. The value of glass in our society is huge, this is an age old but simultaneously incredibly fresh and contemporary medium that can teach us something about the value of an object that a China or Mexico produced (knocked out) mass ware item will never be able to. When you see or hold handblown glass there is a connection that you will not experience with mass market products. In theory wine, juice or water should taste the same out of every drinking glass for example, however in practice: if you have any sensibility at all then the experience of drinking from a handmade vessel will be far superior and infinitely more pleasurable than from a throwaway valued glass or paper cup..
Back to Ivan Mora: look him up! He is a really successful artist making his way in the world; quite literally globally! And all the while he is also a real pleasure to speak with. This is the best combination in an artist isn’t it? Talent, success and absence of attitude. Brilliant stuff! Watching the casting process for a large glass art piece for Ivan Mora, another inspired and talented glass artist who works internationally! Today we had the opportunity to catch up with him a bit and I learnt that he was artist in residence for an extended period of time at the glass studio Berengo in Murano, Venice, Italy. In Spring – summer 2013 Jason spent some time at Berengo Glass Studio before moving on to getting more hands on involved at Zanetti (practically around the corner from Berengo). These are some of the world’s utmost renowned glassmakers and it was really exciting to hear personal stories of Ivan’s time there as well as to get to know him a bit better over a cup of coffee. A flash from the past when Jason was full time employed making glass for somebody else than himself. He used to make ornamental pumpkins, apples and pears, some vessels, some special projects. In the 6 years with his previous employers Jason quickly rose to head gaffer (aka: head maker) which means that he was the one holding the highest responsibility for that each glass product is finished exactly as designed. The high pressure work environment left a couple of physical injuries but also gave Jason complete confidence in his skills as a technically competent maker.